As we were sleeping in a tent, we of course woke up as soon as the sun rose. Since we’re lazy and it was still fairly cool out, we were able to go back to sleep for a little while. The temperatures in the canyon can vary greatly. The average difference between the rim air temperature and the river air temperature is about 30 degrees. So while it was barely 70 degrees on the rim when we left, we knew that before this day #2 was over, we would be facing temperatures near or upwards of 100 degrees. Ouch. When we finally got up, we discovered that we were the last ones left in the camp. Everyone else must have taken off as soon as the sun came up. Kurt and I ate a little breakfast consisting of an orange and a couple of granola bars, with a good amount of water to wash it all down. After packing everything up and donning our boots (I expected them to hurt, but they weren’t too bad…), we refilled our water bottles and put our packs back on. Amazing how they rubbed in all the same places they had the day before… the spots went numb quickly, thankfully. Kurt and I set out for day #2 adventure. The terrain was completely different from the day before. We followed Garden Creek for the first mile to mile and half of our adventure. The trail itself still stayed in the side canyon, but since there was water beside it, the environment was entirely different. There were actually deciduous trees! Our mood was light and fun as we followed the trail through the shady canyon. However, the best part was yet to come as we rounded a bend and got our first view of the inner canyon. We found ourselves below the plateau, with an unobstructed view of the layers on the north rim. The morning sun amplified the shadows and literally took our breath away. I thought I had felt small the day before as we stood on the rim, but it was nothing compared to this. We stood for a while and admired the view across the canyon, the waterfall in front of us, and the huge drop to our right that the trail followed. We also took the time to admire the flowers that were in full bloom. After our relaxing break, we headed down a series of steep switchbacks with little to no shade. We were no longer following the stream and we realized it was getting hotter and hotter the further down we went. Heat, here we come! After what seemed like 10 miles (really only about 3.5), we reached the bottom of the canyon. Keep in mind we were still in the side canyon, so since our spectacular view mentioned above, we hadn’t been able to see much of the main canyon, let alone the river. We got our first view of the Colorado River (which Kurt didn’t think was really there all along, hence our real reason for the trip) after we rounded the corner of a cliff. Ahead of us lay the river, and a beautiful sandy beach (albeit small). We headed off the main trail toward Pipe Creek Beach. Of course the first thing we did was de-pack ourselves. The boots were next. We had to test the water of course, to see just how cold it was - VERY cold, actually. It felt great on our tired feet, but we couldn’t stand in it for very long. We decided this spot might be the perfect place to attempt to fly the box kite we had carried with us all the way. We didn’t have much luck, though. Evidently not enough of a breeze in the big hole. After our short break, we regretfully put our shoes and packs back on and continued our journey. Getting back to the main trail was our first real ‘uphill’ test of the adventure. Don’t forget it was now at least 100 degrees. It was tough to say the least. The main trail also continued uphill for a ways. In all, considering the heat, the lack of shade, and the incline, I thought I was going to keel over! This didn’t make me too anxious for the trip out the next day. This part of the trail followed the River through the inner canyon for about 1.5 miles. The trail was a mixture of up and down and often consisted of fine, powdery sand making it a very difficult walk. Finally, we reached the Bright Angel Suspension Bridge. 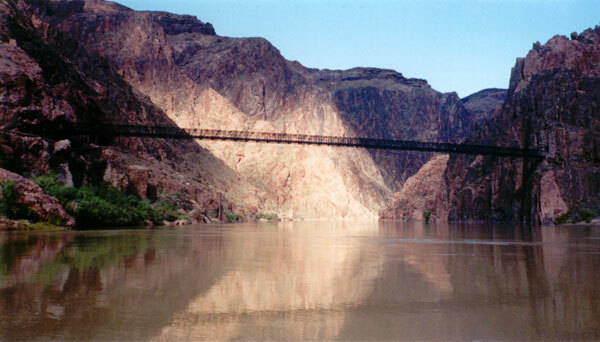 There are actually two suspension bridges (two bridges period) that cross the Colorado. We could see the second bridge a ways down the river and knew we would cross it in the morning on our way out of the Canyon. 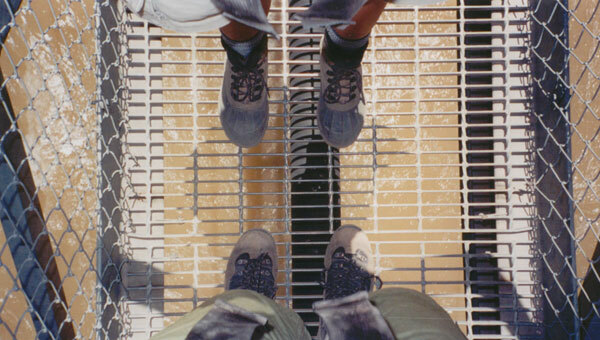 The thing about the Bright Angel Suspension Bridge is that the walkway is made of iron mesh, allowing all who cross over to see directly between their feet to the river 40 feet below. We had finally reached the lowest point of our adventure, some 4400 feet beneath the rim. I wasn’t sure whether to be ecstatic or frightened (about the trip up). We crossed the river and continued past a ranger station. On the other side we found another bridge, this one crossing the Bright Angel Creek, which flows down from the North Rim. Kurt and I followed the creek up a short way and found the entrance to the Bright Angel Campground. You can probably imagine the excitement we felt when we saw other campers wading and ‘swimming’ in the creek. This gave us a final jolt of energy and made us want to hurry and find a camping spot so we could cool off! The campground was very similar to Indian Gardens. We did find a few more open camping spots, though, as we were arriving earlier than the previous day. We managed to find a nice, shady spot and unloaded our packs, stowing our food in the provided bear boxes. We then removed our hiking boots, donned our flip-flops and headed toward the river. Again, the water was very cold on our feet and even colder on the rest of our skin! But we eventually sat on a rock in the midst of the rapids and immersed ourselves - face and all. The cool water certainly helped to substantially lower our body temperatures. After cooling ourselves down, we decided to partake in a little lunch. We heated ourselves another MRE – this time Kurt and I both decided on the Chicken and Rice. Once again, there was the cracker and grape jelly, as well as the fig newtons included in each package. The Chicken and Rice proved to be delicious, but hey – we’re in the bottom of the Grand Canyon. Just as the day before, we were both a little hungry after we were done eating. We relaxed a little while longer, then decided to go investigate the Phantom Ranch. Phantom Ranch is a camp run by the National Park Service that provides cabins with bunk beds that rent for around $60 a night. The Ranch will also prepare meals if desired, but they are a little steeper in price – a standard sandwich meal for $10 or so and a steak for $25. And these are not extravagant meals what-so-ever. 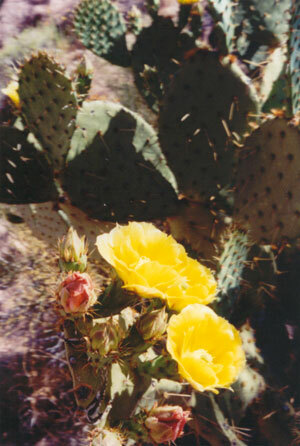 Phantom Ranch is where most of the mule riders stay. We met several mule trains going up the trail on the first day. Just out of curiosity, Kurt looked up the price for a mule trip, and it was around $300 for off-season trips. When we met these mule trains, we discovered that most of them were not carrying very much luggage. We also met several groups of hikers on the first day that were only carrying a small day pack but when we talked to them, they stated that they were staying overnight for several nights at the Ranch. The very first thing we noticed when we arrived at the Ranch was a guy walking by, looking freshly showered, carrying a glass of ice! We were so tempted to tackle him and gobble down the ice… it was so incredibly difficult to resist! The next thing we noticed was a helicopter coming in for a landing. We moved in the direction that it appeared to be going, but once we got about 50 yards from the landing pad (the ‘copter was already on the ground), a girl who had hopped out of it adamantly waved us away and we had to go around a corner where we couldn’t see what they were doing. However, around this corner, we saw several packed gunnysacks with dates and names. We surmised that the people coming down on foot without much gear and also on muleback must send their gear – clothes, etc. – down ahead of time so they don’t have to carry it. We decided they were nothing but lazy. Sorry – our sore muscles and tired bodies would allow us nothing but sarcasm at this point. We left Phantom Ranch and decided to head back for a walk along the Colorado River. We found another beautiful sandy beach along the River, this one closer to the Kaibab Suspension Bridge, the second of only 2 bridges that cross the Colorado River at the bottom of the Canyon. There was a very calm pool in front of this beach. Most of the River has a stiff current, but this section appeared perfectly idle. Regardless, there is no swimming in the Colorado River. We threaded our way out onto some rocks in the middle of the water where the Bright Angel Creek flowed into the Colorado River. It was quite humbling to look around and think about the age of the rocks – the oldest at the bottom are 1.7 million years old, slightly less than ½ the age of the earth. Being inside the inner canyon is like being in a completely separate canyon. 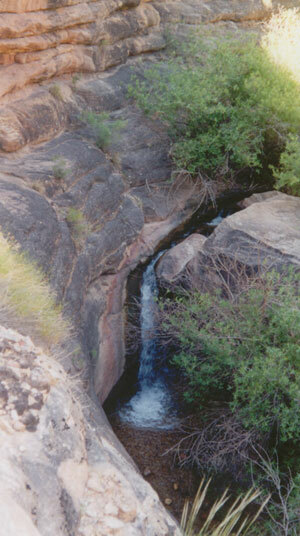 From this section of the River, the rim was hidden from view. We wished we could look up and see where we had come from, but it just wasn’t possible. We headed back to the camp and had another MRE for dinner. This time I had the Chicken and Pasta, and Kurt had the Beef Ravioli. Once again, we found ourselves licking the foil wrappers clean. We hoped there would be enough food for our trip out the next day.